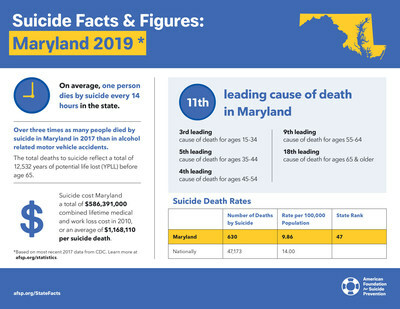 ANNAPOLIS, Md., Feb. 12, 2019 /PRNewswire/ -- Suicide is the tenth leading cause of death in the United States, and it is the eleventh leading cause of death in Maryland. On Thursday, February 14, advocates from the American Foundation for Suicide Prevention, the largest suicide prevention organization in the United States, will arrive at the state capitol to meet with lawmakers to encourage them to prioritize suicide prevention initiatives for Maryland residents including support of SB 395/HB 77 that would decriminalize the act of attempting suicide, SB 28 requiring coverage of mental health services under short term health insurance plans, and SB 521 the Veteran Suicide Prevention - Comprehensive Action Plan. "As volunteers with the American Foundation for Suicide Prevention, we have lived with mental health conditions and with suicide loss. As advocates, we have the opportunity to share those stories directly with the men and women we've elected to represent us in Annapolis. Our personal stories are the most impactful tool we have. As an advocate, one person truly can have a direct impact on public policy, legislation and fiscal priorities," said Sue Maskaleris. AFSP Maryland Chapter Board Member and Advocacy/Public Policy Committee Chair. The AFSP Maryland State Capitol Day is a special day for all who have a connection with or a personal story around the topic of suicide. Volunteers will meet with their state legislators and share their stories about why they participate in this advocacy effort, giving a human face to this important health problem. Advocates hope that by sharing their stories, they will help legislators understand that state investments in mental health and suicide prevention can save lives. AFSP Maryland Chapter advocates are part of a larger national movement of AFSP volunteer advocates who will be visiting over 40 state capitols across the United States in 2019 to bring best practices in suicide prevention to state legislators and their staff. To learn more about AFSP's advocacy efforts, visit here: https://afsp.org/our-work/advocacy/. One American dies by suicide every 11.69 minutes and 90% of those who die by suicide had a diagnosable mental health condition at the time of their death. AFSP volunteers will urge state lawmakers to be the voice for the thousands of Maryland residents affected by suicide each year.